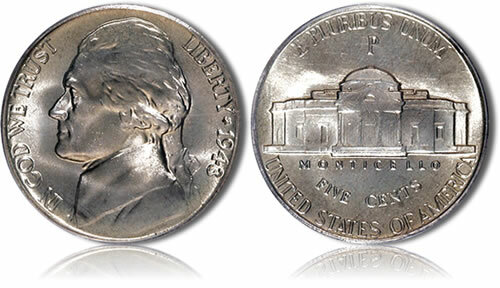 The Jefferson Silver Nickel, also known as the Wartime Nickel, was struck by the United States Mint from 1942-1945 from a composition of 35% silver. As struck, each coin contained .05626 ounces of the precious metal. The coins actually first appeared in 1938, but at that time were produced from a cupro-nickel composition. The design on the coins was taken from the work of Felix Schlag who won a competition against hundreds of other artists. His portrait of Jefferson was based on a marble bust of the third President of the United States by Jean-Antoine Houdon. The standard composition of the 5-cent piece continued until 1942 when a critical shortage of the metal nickel (owing to World War II) forced the United States Mint to change the composition of the strikes to instead contain 56% copper, 35% silver and 9% manganese, thus resulting in "wartime" Jefferson Silver Nickel. To differentiate these coins from the standard composition releases, the United States Mint included a large mintmark above the image of Monticello on the reverse. It also pressed a ‘P’ mintmark for those produced at the US Mint’s facility in Philadelphia, the only time the ‘P’ was used on a circulating coin until 1980. Silver continued to be used in the coins through 1945 when the end of the war alleviated metal shortages and the US Mint returned to their pre-war standard composition. The obverse of the 5-cent piece contains a portrait of the third President of the United States, and a founding father of the country, Thomas Jefferson. The portrait was completed by Felix Schlag with the inscriptions of IN GOD WE TRUST, LIBERTY and the year surrounding it. For the obverse, an image of Jefferson’s home known as Monticello is shown. It was also completed by Felix Schlag and included the inscriptions of UNITED STATES OF AMERICA, E PLURIBUS UNUM, FIVE CENTS and MONTICELLO. The Wartime Nickels also included a large mintmark above Monticello.